In an earlier column, I discussed how to use The Book of the Righteous (BotR) with the Freeport setting. The generic references to gods used in most Freeport titles makes it possible to use the detailed churches and mythology from BotR with that setting. 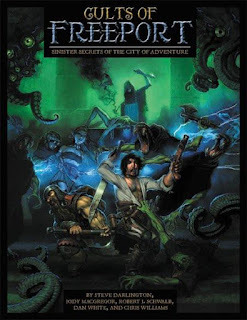 Cults of Freeport represents a change from the product line's generic approach, providing more detailed information on eight secretive cults' religious practices and doctrines, plus profiles of their leaders in the City of Adventure. However, BotR can be used with these cults as well, as a source of Fifth Edition domains and subclasses. Before I look at each cult individually, I'd like to discuss some common threads for the book as a whole. One recurring theme in Freeport is the infiltration of temples by devotees of other gods. The Book of the Righteous provides an excellent rationale for how these schemes are allowed to continue without swift divine retribution. The gods' Compact (BotR, pp. 8 and 236) ended the terrible tragedies inflicted by the early wars between the gods by limiting their ability to interfere in the mortal realm. The Compact binds even Asmodeus, but permits devils, daemons, and demons to tempt mortals, as the price of allowing them to have free will. BotR gives examples of corrupted and heretical sects that continue to receive divine power--though it's possible that some receive that power from a source other than the original god. The book includes a detailed example of one church that has been taken over by an evil conspiracy secretly dedicated to another god. The gods may choose to send warnings about such threats, within strict limits, though some may have their own reasons not to interfere in such tests of their churches. Encounters with the faiths detailed in Cults of Freeport pose serious threats to the heroes' sanity as well as their bodies. If you wish to use these cults in your 5E campaign, I strongly recommend using the madness rules from the DMG, and possibly even the Sanity score rules. Even if you don't use those rules during all adventures in your game, applying them during encounters with servants of these mad gods can greatly enhance the horrors that these cults worship and perpetuate. Note that cult leaders are not necessarily clerics. Some will belong to other spellcasting classes, such as the wizards of the Esoteric Order of Starry Wisdom and the Obsidian Brotherhood. Others might be warlocks who have a direct personal relationship with their patron. The Archfiend patron is appropriate for Yarash and Abaddon, while the Unspeakable One, Yig, and the Crawling Chaos are obviously Great Old Ones. While Mordiggian is technically a Great Old One (being a later addition to the "Cthulhu Mythos"), the Undying patron (Sword Coast Adventurer's Guide) might be a better match for his promises of immortality. "The Unspeakable One" posits that the Nameless One turned away from the creation in order to protect it from the ancient horrors that he discovered outside it. He remains distant and Nameless in order to avoid drawing those beings' attention to himself or his creation. "The Source of Tinel's Sorrow" presents a heretical belief that Tinel and Yig are the same deity, and that Tinel's sorrow stems from his destruction of Valossa. This story gives two competing origins for the Unspeakable One: Either 1) it is an entity from outside the Great Sphere, whose followers corrupted other serpent people under the guise of Tinel worship, so that Tinel was forced to destroy his beloved Valossa, or 2) it is the manifestation of Tinel's own madness, and it was this aspect of Tinel that destroyed Valossa. Finally, two free web enhancements for Cults of Freeport (written by Robert J. Schwalb and myself) provide True20 and Third Edition ("3rd Era") stat blocks for the NPCs described for each cult. The latter document also provide domains and favored weapons for deities not featured in the Gods of Freeport table in the 3rd Era Freeport Companion. While a full conversion is beyond the scope of the current column, some of that cleric-specific data has been adapted to Fifth Edition below. The Unspeakable One is chaotic evil, and its clerics gain the Madness domain. Oathbreaker paladins can be used to represent unholy warriors dedicated to the god. In the "scales of Yig" cosmology described in this chapter, Yig is credited with creating the primordial world that evolved into the World of Freeport. Therefore Yig and the Unspeakable One predate the younger races' gods. As yet another alternative to the Tree of Life myth mentioned above, some scholars might interpret the primordial Yig as the serpent people's version of the Nameless One. (This would make the serpent people the only race ancient enough to preserve enough knowledge about that god to actively worship him.) In any case, Yig's collection of pieces from different worlds gives a handy explanation for the arrival of other gods, such as the Three Sisters and Three Brothers (as well as Lowyatar, discussed in her own chapter, below). Like Terak and Tinel in The Book of the Righteous, Yig has two aspects with different alignments. The Hitthkai Sect worships Yig's neutral aspect, which grants the Knowledge and Trickery domains. The Sskethvai Sect worships his neutral evil aspect, which has the Fire and War domains. A champion such as K't'Kah would probably be best represented by a monk of the Way of Iron tradition. Bards of the college of lore would be well-suited to infiltrating sites of learning such as the Freeport Institute. Yarash is chaotic evil, and grants only the Death domain. Some oathbreaker paladins revere him, but any "unholy warriors" who serve him are more likely to be path of the zealot barbarians (Xanathar's Guide to Everything), or simply berserkers. For even more information on Yarash's cult, see Black Sails Over Freeport. Most of the Cult History section of the Lost Souls chapter was distilled from that mega-adventure. The Crawling Chaos is chaotic neutral. The Starry Wisdom cult in Freeport is composed exclusively of wizards, with no clerics. Where his cults do have priests, the god grants the Death and Madness domains, and possibly Arcana (from the Sword Coast Adventurer's Guide). The cult's holy warriors are typically fighters (eldritch knights) like Lord Defender Thorgrim. "The Crawling Chaos" is one of the chief epithets of the deity Nyarlathotep (from the works of H.P. Lovecraft), and the Esoteric Order of Starry Wisdom is named after one of that god's cults, but that name is never used here. Nyarlathotep has many forms and cults across a staggering number of cultures and worlds, both human and alien. Some of those aspects are more obviously malign, and should be considered chaotic evil. Possible avatars of the Crawling Chaos in the World of Freeport include the Shrouded Savior mentioned in the background of True20 Freeport: The Lost Island, and the Dark Apostle who has appeared twice in Druzhdin history (Freeport: The City of Adventure). If the latter is an aspect of Nyarlathotep, then what is his motive for promoting the traditional worship of the God of Death? Freeport's Temple of the God of Warriors is a prime example of an enemy cult that has infiltrated and seized control of an established church. In terms of The Book of the Righteous, the Scions of the Destroyer might use the trappings of the Cult of the Bound Rod (the corrupted cult of the war god Terak) to deflect suspicion from their true god and purpose. As a demon prince, Abaddon is chaotic evil. His clerics have the War domain. However, most "acolytes" belong to purely martial classes, such as fighter or barbarian, instead. The Destroyer's truly unholy warriors are oathbreaker paladins or oath of treachery paladins (Unearthed Arcana,"Paladin: Sacred Oaths"). Mordiggian, the Charnel God, is chaotic evil. His clerics have the Death domain. His cult in Freeport has no unholy warriors, but he does count many necromancers among his servants. For a quick and dirty conversion of the Cannibal Ritual, use the rules for the polymorph spell, but the celebrant assumes the form of a ghoul, retaining hands and speech. (The younger children will also remain Small in size.) More experienced cultists might assume the statistics of a ghast. The cult's leaders regularly summon fiends for various purposes. Use the infernal calling, summon greater demon, and summon lesser demons spells from Xanathar's Guide to Everything) for these rituals. Note that in 5E, succubi have been turned into fiends that are neither devil nor demon, but they should be allowed as options for either infernal calling or summon greater demon. The Wanderer's alignment is unknown. In his current shattered state, he has no clerics or holy warriors, only the obsessed wizards and scholars (and corrupted priests of other faiths) who serve Xyrades. 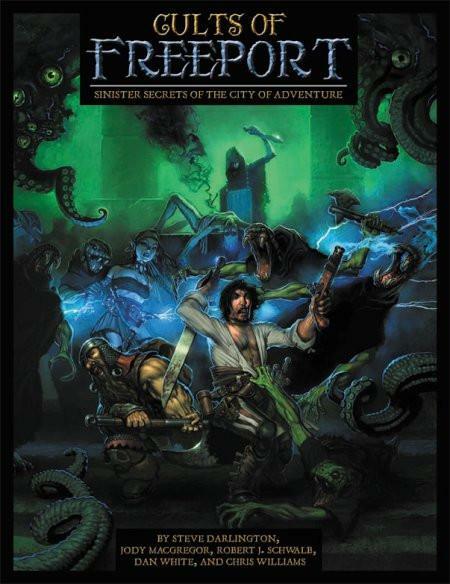 True20 Freeport: The Lost Island also features powerful, magical obsidian shards. That adventure's stones have no explicit connection to the Wanderer, but the similarity of the relics in both sources suggests one--and Xyrades would become very interested in Mokulilo if he learns of those other shards. If the two groups of stones are connected, then any theory about the Shrouded Savior being an avatar of the Crawling Chaos (see above) raises even more questions about the Wanderer's true nature: Is the Wanderer yet another avatar of the Crawling Chaos? Is Nyarlathotep the surviving sentient remnant of the Wanderer? Or is he its herald, as he is to Azathoth in Lovecraft's stories? Creating Pantheons for "Time of the Tarrasque"